A new principle is applied in the construction of the DYNAMIC CHAIR The seat is mounted directly onto a sphere. This enables the person who uses the chair to move the hips and back far more freely than by the use of conventional chairs. At the same time, the user will achieve a better posture, as one compensates for lack of balance by straightening the back. The simple construction of the chair has made it possible to employ few and light components with a low degree of manufacturing while ensuring considerable strength and durability. There are two major problems related to normal chairs used for working, eating and other activities The first is back problems related to ordinary, poor sitting positions. The second is the stiffening and aching of joints and muscles due to inferior blood circulation in the legs and back The DYNAMIC CHAIR solves these problems. 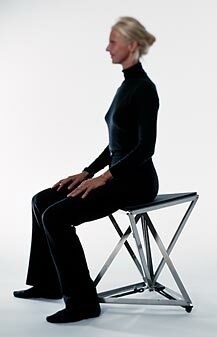 Its construction principle allows the person sitting on the chair to make small movements that strengthen the muscles of the loin and prevent pain and stiffening. When a person sits on the chair, the seat leans slightly forward and gives a good straight position especially to the back and shoulders. Concurrently, a free space is created under the thighs allowing the blood to circulate unhindered. The DYNAMIC CHAIR can replace conventional chairs in every instance. It gives the user a wide reach as the seat turns both vertically and horizontally in all directions. The user is able to roll the hips, as if upon a ball, while sitting down. The user can make the seat more or less movable by regulating the tension of the rubber straps situated at the bottom of the chair. They have four positions. The height of the chair can be adjusted to fit the individual user. The seat rests on a sphere. 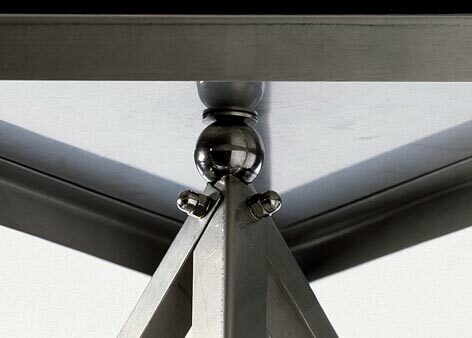 The DYNAMIC CHAIR is constructed of two tetrahedra made of stainless, acid-resistant steel struts. One of them rests on the floor and sustains the other, which is movable. 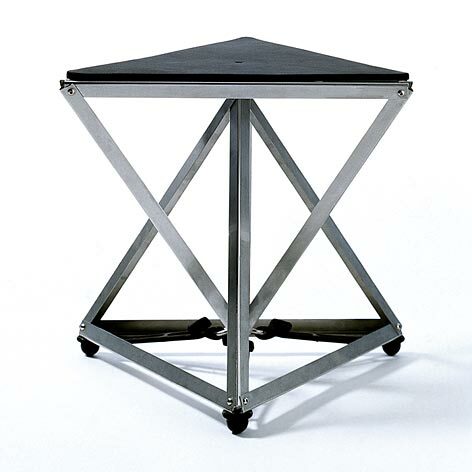 They are connected via a steel sphere The seat consists of a thin steel sheet, which covers the upper surface of the movable tetrahedron The summit of the tetrahedron on the floor is being pulled down via the lower corner of the movable tetrahedron The static tetrahedron transfers the weight to the floor. The center rod and all six horizontal steel struts absorb the tensile forces, while all six diagonal struts absorb the compressive forces. The seat swivels around the center of the sphere on which it rests. Three elastic rubber straps are affixed between the lower corner of the movable tetrahedron and the three plastic spheres The elastic rubber straps modify the swinging movements produced by the person on the seat A pad made of firm, insulating polyethylene foam covers the seat. The rubber straps may lose their elasticity over time. Their life span is one to five years depending on the user. The rubber straps can be replaced without the use of tools. A small amount of oil should be applied underneath the sphere periodically. Dimensions: 590 x 520 x 495 mm.